Your handwritten will must adhere to probate and estate laws in whatever state it was written. Otherwise, South Carolina will not accept it. After you write out the terms of your bequests, be sure to place your signature on the will, as well as the day, month and year when you wrote it. 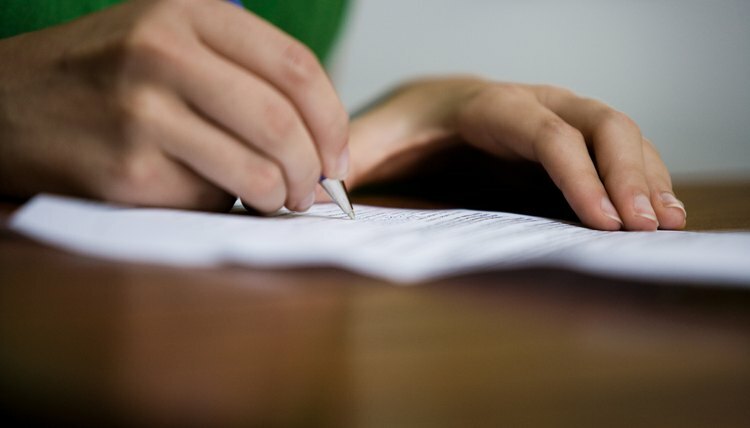 Many people who handwrite their wills believe that the fact that the document is in their penmanship is enough for the court to be able to identify it as theirs, but this is not the case. It must be signed and dated just as a typewritten or printed will is. The Free Library reports that 26 states recognized holographic wills as of 2009. Of these, Alaska, Arizona, California, Colorado, Idaho, Maine, Michigan, Montana, Nebraska, New Jersey, North Dakota, South Dakota, Tennessee and Utah require that only the portions including bequests and provisions and signature be in your handwriting and the rest of the will can be in preprinted format, according to 2010 information from JRank. However, the entire document must be in your handwriting if you made the will in Arkansas, Kentucky, Louisiana, Mississippi, Nevada, North Carolina, Oklahoma, Texas, Virginia or West Virginia. Arkansas also requires that three witnesses attest that the will is in your handwriting and they cannot be beneficiaries. Virginia and Tennessee require that two witnesses certify your handwriting. If you do not meet these state-specific requirements, your will is not valid either in that state or in South Carolina. It is always best to consult with an attorney concerning your handwritten will. You want to ensure that your wording is legally precise enough to achieve your intent and that the will doesn’t include some legal gaffe, making it invalid in the state in which you wrote it -- and by extension, in South Carolina, as well. If you make your handwritten will in one of the states that recognizes them, mail it to yourself via certified mail, taping the seal. The envelope will bear the postmark of the state where you made it. Sign for it, keep it in a safe place, and assuming you met all of the state’s requirements when you wrote the will, it should be legal in South Carolina, as well.